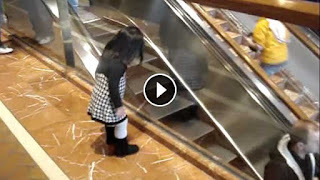 This little girl and her dad were just having some quality time together at the Copley Place mall in Boston when an escalator going down caught her attention and she though it would be fun to do this. Kids will be kids, but the most amazing thing about this is that almost every single person on that escalator played along with huge smiles on their faces. I know this little girl is going to grow up to be an amazing person because making people happy even for a few moments of the day is a gift. Her parents are lucky to have her and I’m grateful they shared a moment of her life with the world.